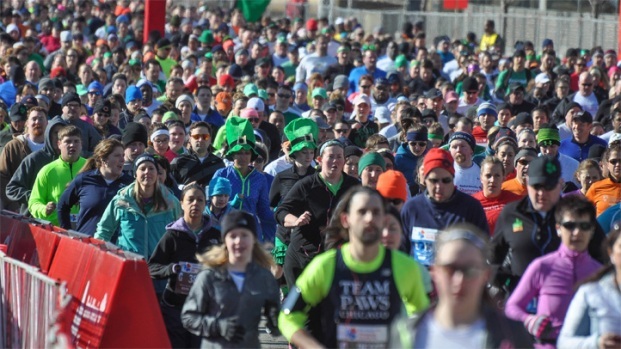 Runners in Sunday’s Bank of America Shamrock Shuffle were met with sunshine and perfect weather for the race that many have dubbed the unofficial kickoff to the Chicago outdoor running season. Green tutus and #ShamrockSelfies abounded as runners from 47 states ran 8 kilometers through the heart of the Loop, trying to run fast and live Irish. One major change to this year’s race was the implementation of three start waves, with separate start times and gear checks to help the race run more smoothly. Efficiency is key in a race that requires coordination of 3,000 volunteers to hand out 400,000 cups of nearly 27,000 gallons of water and Gatorade. If you’re looking to find out the results of the race, check out the Shamrock Shuffle’s official results page here, and if you’re thinking about running it next time around, get some inside perspective on the race’s Yelp page from those who have shuffled before. Or you can head to the post-race party tonight (for runners 21 and over) at The Scout Waterhouse & Kitchen (1301 S. Wabash St.) until 1 a.m. to hear their thoughts for yourself. With great weather and happy runners, today’s Shamrock Shuffle goes to show that the 2014 Chicago running season is off to a great start!